These are the words of Ekow Mensah, founder of WomanRising. WomanRising is a non-profit social Enterprise, an initiative of the African Network of Entrepreneurs (TANOE) focused on the consistent development and advancement of women in business in Africa. WomanRising’s aim is to equip women to succeed in business and life through access to information, capacity building through training and coaching, branding and productive networking support and entrepreneurship development. The conference had prominent speakers like Joyceline Coleman, Jesse Agyepong, Sylvia Asana Dauda and last but not least, Yvette Atekpe, who had an interactive session with attendees of the program. 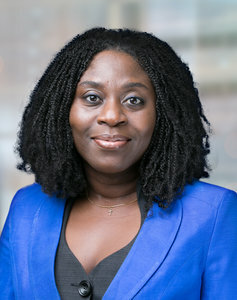 Joyceline Coleman is a partner responsible for the Accounting Advisory Unit of KPMG (Klynveld Peat Marvick Geordeler) in Ghana. She has 20 years experience in Financial Management Software Implementation, Project Management, Designing of Financial Reports, Training and Development and the Auditing and Review of Computerised Systems. Joyceline Coleman was the first speaker for the conference and she spoke on the topic, ‘Personal Development‘. ‘ You are developing yourself to make you relevant’. This is something most people overlook in their lives. They forget themselves and rather concentrate on how to make a living. Personal development requires a lot especially in an era that women have realised they can occupy the positions men have acquired. ‘Look at yourself, see what the world needs and do something creative to change the world around you’. People have made it in life by making a decision to do so. Don’t just speak but act what you have spoken, that is the only way to bring a change. Do you wish to join the business world? Joyceline states five expectations of the business world. You must be able to communicate or interact with people around effectively. This can be verbal, through good writing skills and body language as well. Effective and clear communication establishes clear understanding of information that will be decoded by the receiver. This is the ability to identify, use, understand and manage your own emotions in positive ways to communicate effectively.This has emotional awareness, harnessing and managing emotions. Being aware of your emotions will enable you to know why you are experiencing any other emotion. Monitor your emotions along with your thoughts and self talk. Know yourself and understand your emotions to prevent any interferance with your work. You must exibit strong moral principles when working. Being reliable, dedicated, productive, character and ability to work as a team should be ethics you possess. An individual must have ethical values to determine what is right and wrong, with commitment and hardwork as traits. Be keen and have the speed in understanding and deciding on a business situation. Be smart enough to obtain information about a situation with a possible solution. Be a computer literate as well to enhance your presentation. Are you a problem solver? Are you a critical thinker? The business world demands people who can analyze information by applying different sources of knowledge in solving problems. Withholding personal judgement, a good critical thinker can separate facts from opinions. The business world is competitive and it depends on you to overcome your fears and shout out to the world, ‘i can make it, everything is possible’. Be empowered to make a change. Next We Need More Than ‘The Pretty Faces’ In Beauty Contests.